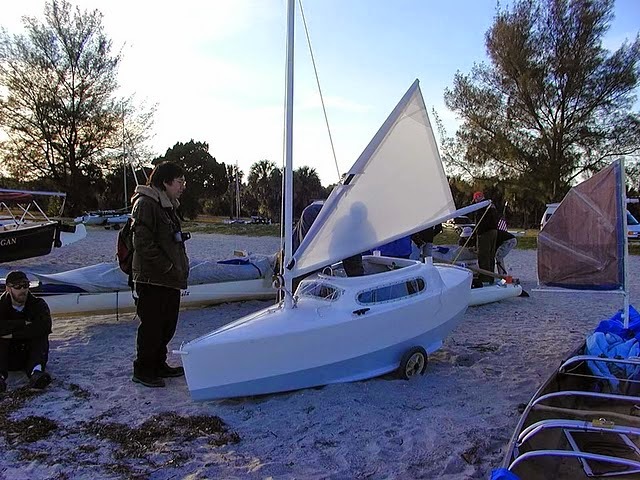 Just over five years ago I wrote Part 1,* and today I’m as entranced as I was then with this minimal sailboat. Over a year later, after writing the article, I found myself looking at Paul H’s ‘Illusion’** with the possibility of buying her and finishing her off to resemble Matt Layden’s ‘Elusion’. 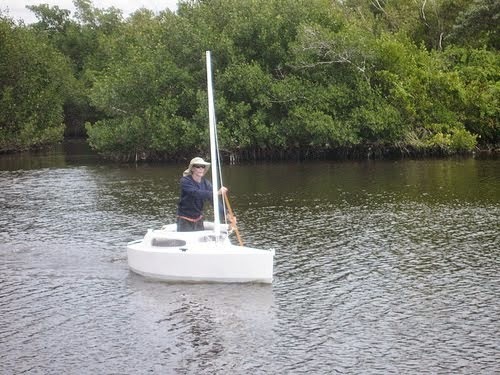 For various reasons I changed my mind and I did not buy the partly-finished boat. She may still be for sale; I don’t know, but Paul’s ‘Illusion’ webpage** is live, and nothing appears to have changed. However, I have changed; I am five years older and my enthusiasm for doing a new building project has somewhat diminished. 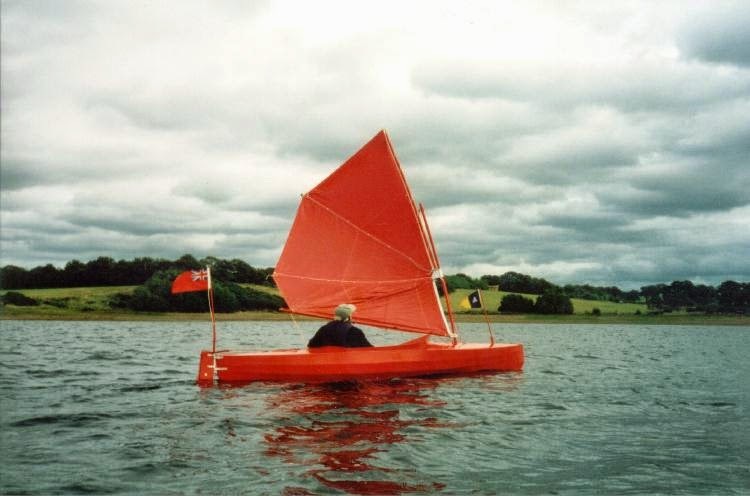 What is amazing is that I am still intrigued with the magic of this fantastic little boat, i.e., Matt’s ‘Elusion’. She charms me. If ever I were to get back on the water, something liker her would be ideal for pottering on my local river. It seems I’m dreaming again, and there’s nothing wrong with that. 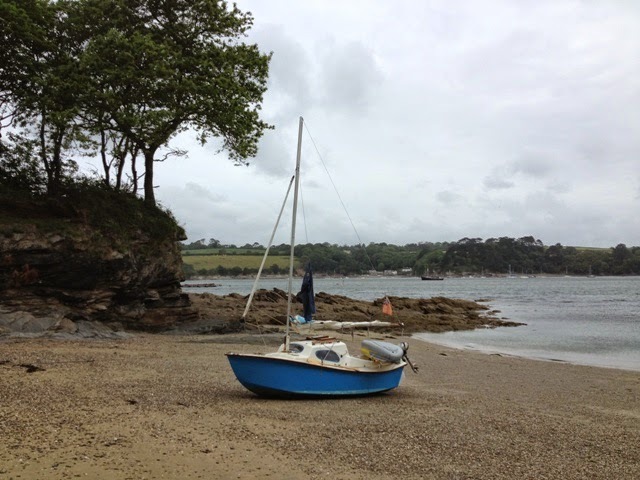 Here are six photos taken by me of a variety of sailing boats. Links below make reference to them and place them within their contexts. 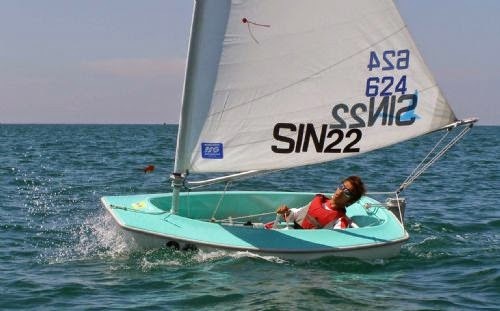 Sailing for the disabled is a big subject. It is not my intention here to explore the subject in depth, but rather to focus on the Hansa 2.3, of which over 1,000 have been manufactured and distributed in 20 countries. 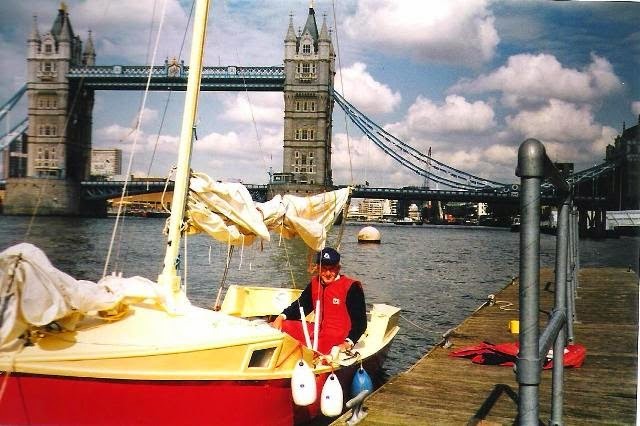 There’s an active UK Hansa Class Association that promotes the sale and the use of Hansa sailing boats designed specifically for people with disabilities. 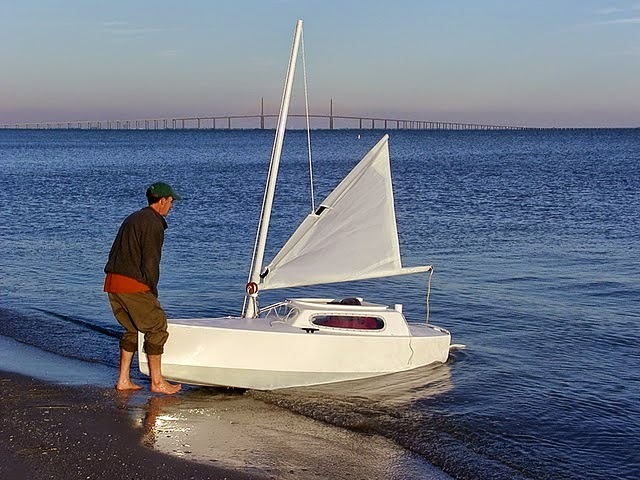 The basic design principles determining the nature of these sailboats are for them to be safe, stable and easy to sail. In the manufacturing process, consideration is given to causing minimal impact on the environment. The series of Hansa boats allow for progressive development for their users from novice to expert, the latter being able to achieve high performance sailing with the more sophisticated top of the range boat, the Skud 18 for Paralympic competition. 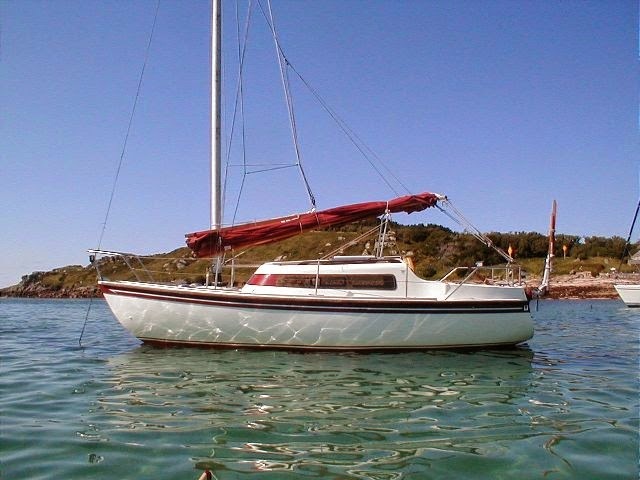 The smallest vessel is the Hansa 2.3 which is the basic model and cheapest of the boats. As her name suggests, she has an overall length of 2.3 metres. She can be sailed by one or two people who sit facing forward and who steer by controlling a joystick. 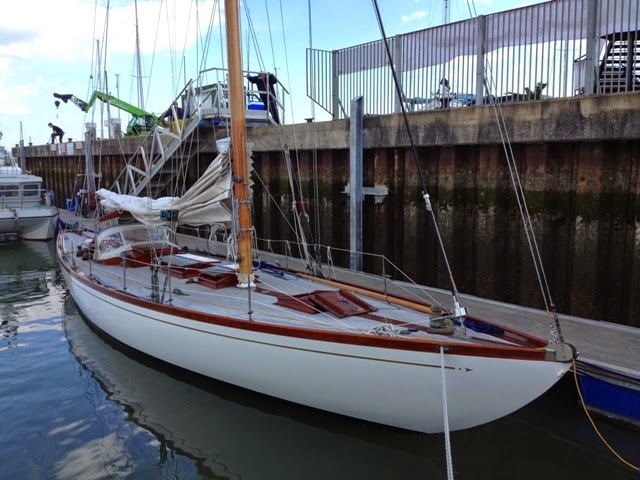 She has a single, roller reefing sail. Her 20 kilogram drop keel makes her virtually uncapsizable. For those with severe manual disability she can be controlled by a servo-electric system for operating the rudder and managing the sail. 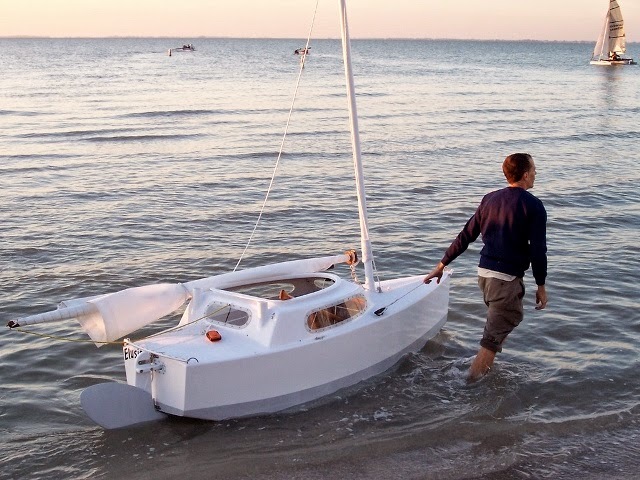 These tiny ‘yachts’ are suitable for a variety of users, not just the disabled. Elderly sailors, who are not as agile as they were when younger, would find them ideal for getting out on the water. 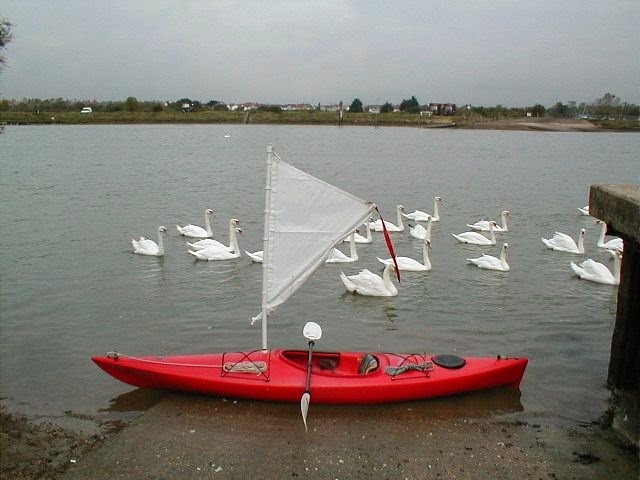 They are practical boats for those wishing to learn to sail because they are safe and easy to manage. At the same time they are excellent for people with varying disabilities to compete in one design racing. 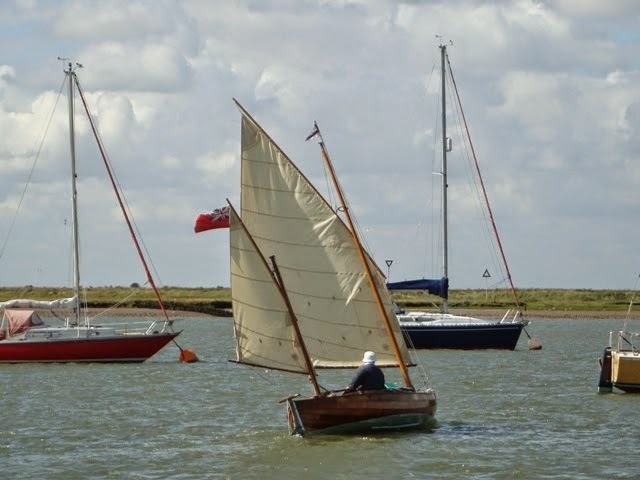 This year the Rutland Sailing Club will be hosting the International Hansa Class Association Bruce Wake European Championships from Monday, 6th July to Saturday, 11th. I have been here before - a crossroad similar to others taken in the past, but now things are different. I can see the present, from a lifetime’s perspective. I can look back and be thankful for opportunities taken and for wonderful experiences and for the fulfilments of many a dream. A lot of them were of sailing small boats, where and when I could. At this particular crossroad, I know that options for the future are limited, because of my age which has brought restrictions, both physical and mental. I am no longer as strong or resilient as I was. Youth is no longer on my side, and unavoidably, truth tells that a final horizon is closer now than in the past. Inevitably that expanse beyond the horizon draws closer and closer, drawing me to the greatest and last adventure. That does not mean that all hope has gone for yet more of a future before passing beyond the horizon. Where there is life in the old seadog there is still hope! Woof! Woof! 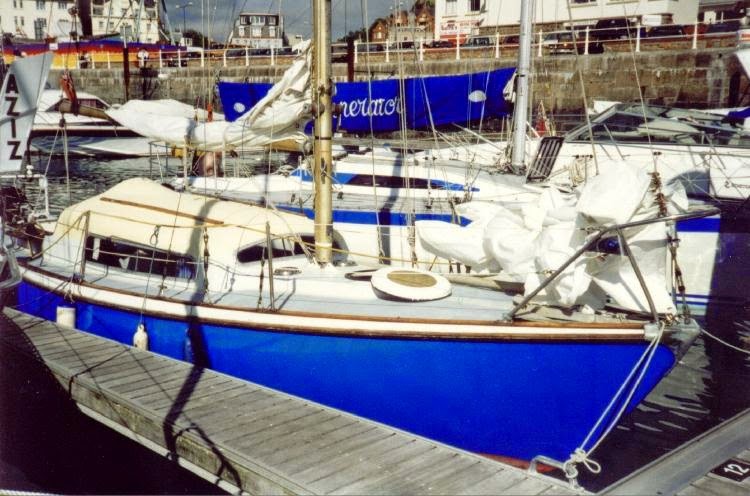 Having sold ‘Minnow’, I find myself once again without a sailing boat, and all that is entailed in owning one. There is a vacuum which instinctively I want to fill by purchasing or building another. Now I am at another crossroad. What direction shall I take? Will it be to endeavour to fill the vacuum with other things, or will it be a boat? Could I ever swallow the anchor? 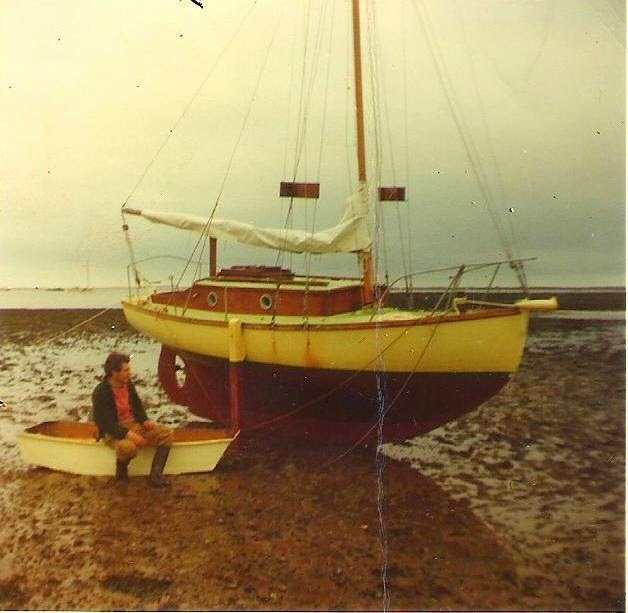 Could I ever be contented without a boat? Only time will tell, and perhaps not long at that. 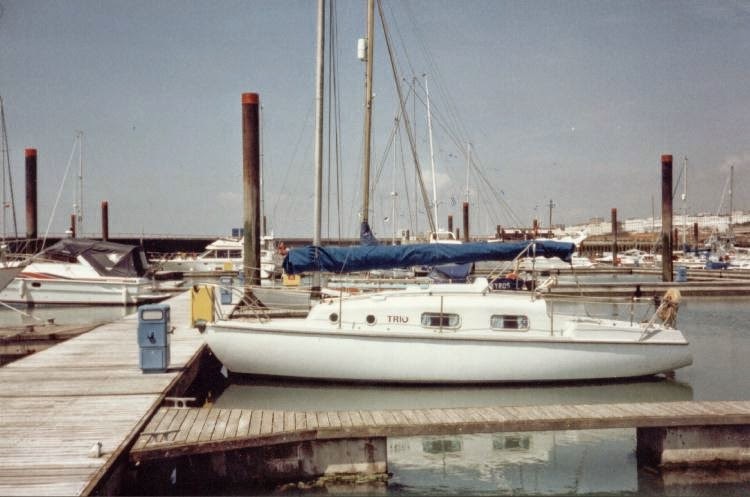 The photos are of boats I have owned, some of which I built. I know of people who own several boats. They are boat junkies. It is impossible for their owners to sail them all, at the same time! Choices have to be made as to which to sail, and time has to be found to do it. 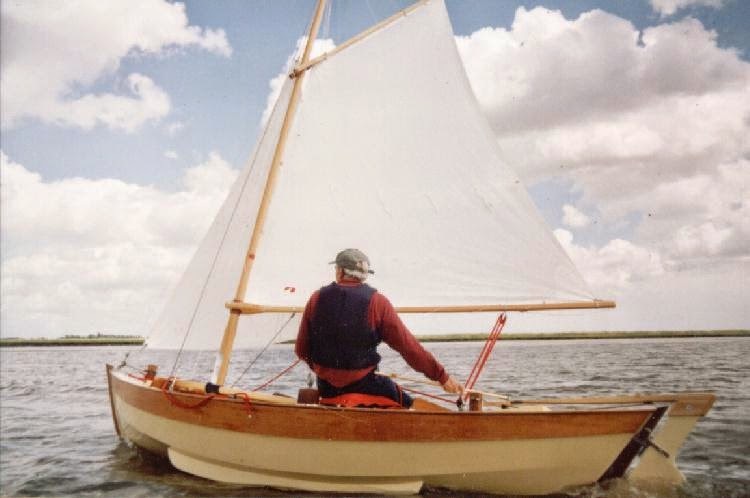 Costs of ownership escalate, and maintaining a personal flotilla can become a nightmare on account of the effort and expenditure required, especially if they are of the wooden variety. Fibreglass vessels are not maintenance free, as one may suppose. Whatever the vessel, if she deteriorates, her value falls; in the extreme, she becomes a liability. She cannot be sold; no one wants her. 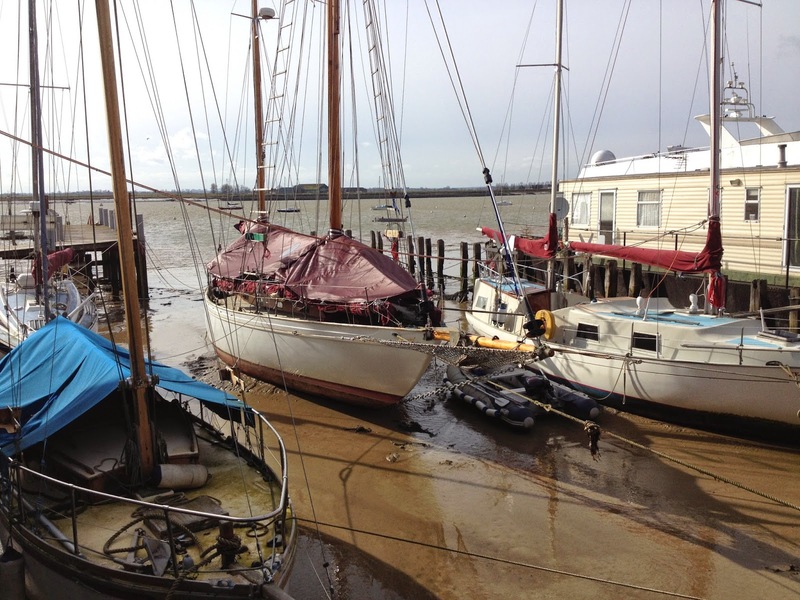 Many such vessels litter boatyards and dumping grounds at sailing clubs. To me, it makes a lot of sense to own one, or perhaps two boats at most. 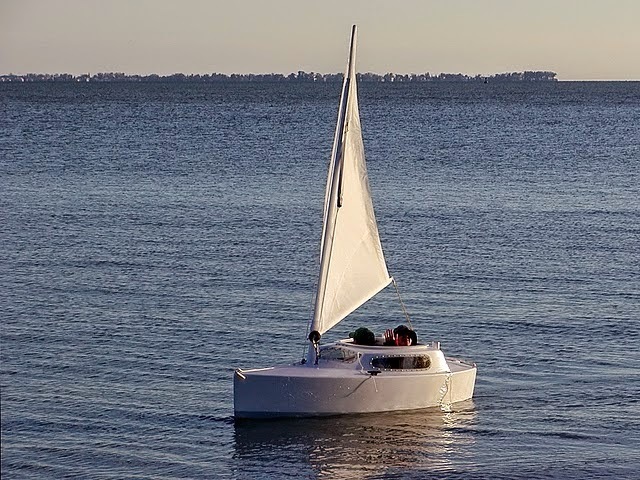 I can see the merit of owning a sailing dinghy and a sailing cruiser; the former for impromptu outings, and the latter for planned trips and cruising excursions, including one or more longer cruises. 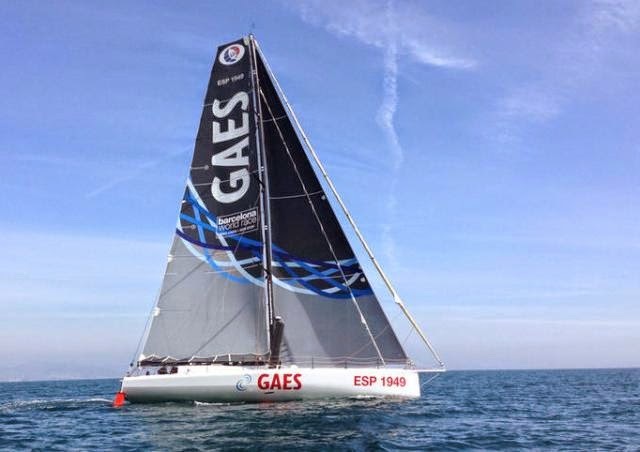 There may be merit and justification in owning a specialist boat, such as particular class for racing, as some sailors like both cruising and racing. Boats can be seen as investments, but more often than not, they lose their monetary value over time. However, there are certain makes of yachts that appreciate as the years go by. They can be sold for more than was originally paid for them. An increasing monetary value does not constitute the only true investment; another can be found in enjoyment and satisfaction through use of the vessel. If there is no enjoyment, no fun in ownership, and worse still, hassle - time and money have been wasted! Fun and enjoyment brings wellbeing, which adds years to ones life. Sailing is a health-giving activity, bringing benefits in terms of exercise, both for the mind and the body. You can go to work on a Monday morning with a grin, and a glow on your face is there to be seen by all. You can’t wait for next weekend when you’ll be on the boat again, and you are looking forward to a month or so, when that special adventure, the summer cruise will begin. On the sober front, boat ownership brings responsibility. You are responsible for all aspects of boat management. Is she insured? Is she seaworthy? Am I fit enough and skilled enough to handle her? Can I look after those who will sail with me? Have I made out a passage plan? Have I fully prepared for possible eventualities? Taking a boat to sea is a responsible business. Forethought must be given before leaving the mooring. What is the forecast, and is there a bolthole if things get nasty? Do I know the rules of the road at sea, and am I confident of handling an emergency situation if it should arise? 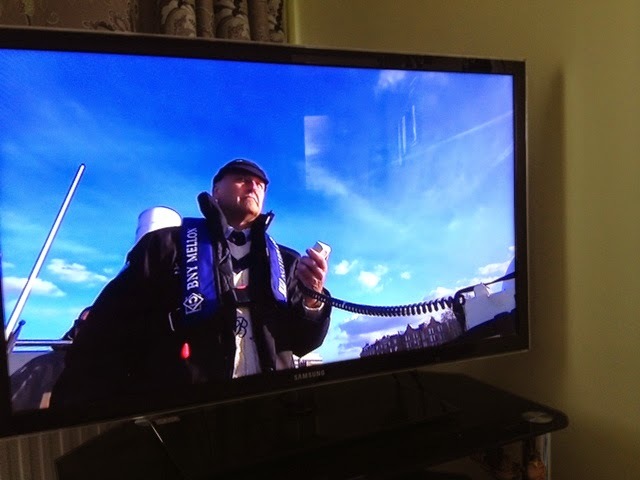 Am I competent at handling the VHF? Owning a boat can be a joy, or it can bring hell, but much will depend on your judgment and choices made. Yesterday there was sadness due to the thought of ‘Minnow’ leaving home. Today there is joy as she has a new home – joy for me because I know she is wanted and will be cared for, and joy for her new owner because he has so much to which to look forward. There will be the initial exploration of what ‘Minnow’ is all about – how things work, and how best to make them work. There will be a time for learning on the water. How do I do this and how do I do that? Where do I put this and that? Mistakes will be made, but the boat is very forgiving. Next there will be growing confidence; then there will come a time of unison when both crew and boat become one. Each will help the other. Their partnership has begun. 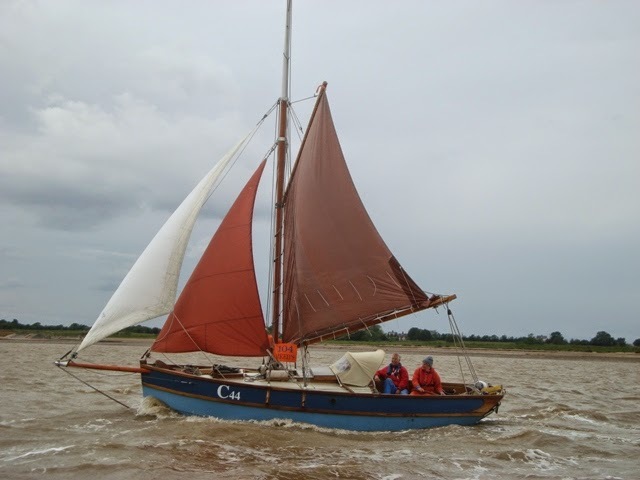 The future is theirs, whether quiet spells on a river, boisterous sailing on estuaries, coastal sailing or a North Sea crossing, from secluded creek to ocean’s horizons. Just to sit and dream, sip tea, enjoy the sun, watch the swans, wile away the evening and spend a night aboard, may be enough for satisfaction, because that’s what it is about …………. enjoyment, fun and pleasure. If it’s not fun, change tack and forget it. Happy times ………….. I shall be thinking of you sweet ‘Minnow’. May God bless her crew. There is a certain tinge of sadness as I see ‘Minnow’ on the driveway ready for her new owner to collect tomorrow. I am reminded of how she came in a bedraggled state and of the work I did to bring her to her present condition. About this time last year she and I were to set off on an adventure, but after a couple of days together I knew I was not up to the job. Things didn’t go well, and I made several mistakes – bad judgments that could have resulted in something serious happening. I won’t go into detail. Suffice it to say, I made the decision to return home. From that time I’ve somewhat lost the desire for long-distance solo cruising. 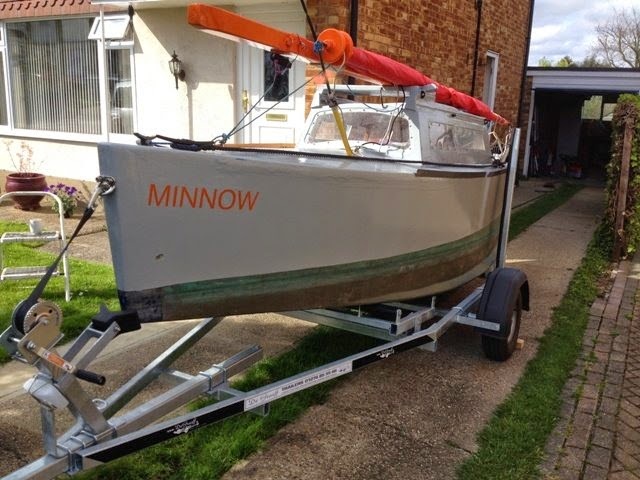 Readers of this blog suggested I should not sell ‘Minnow’, but give time for a change of heart. I took the advice and I did not put her up for sale immediately. As the year went on, it became increasingly obvious to me that I had made the right decision to sell. Several people took an interest in acquiring ‘Minnow’ – some for sure were dreamers. I had enquiries from as far as Australia, and others from Germany, France and Scotland. Closer to home, there were those who came to see the boat, of whom one really had it in his heart to have her. I’m pleased that he has succeeded. She has been his for some time while she spent the last days of winter in the garage. Tomorrow he is due to collect her. Now a boat is not like a car. When you sell a car you say bye-bye and that’s that. With a boat it is different. 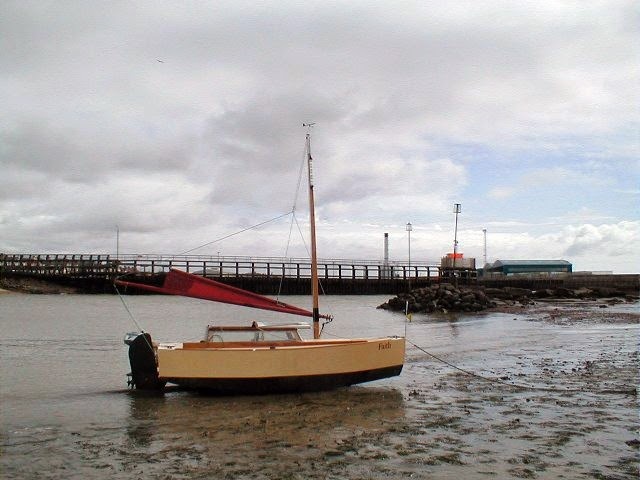 A boat has so many characteristics and her owner knows how best she can be managed. He learns this by association with her. Therefore, when she is taken by another, the previous lover wants the very best for her and her new master. He cannot see her go without telling how best to have a working relationship. To that end I usually make a list of observations and advice for the new partner to help things get off to a good start. Below, you can see these, ‘Thoughts Re. ‘Minnow’. They apply to her, but some observations may be useful to owners of other Matt Layden Paradoxes. Trailering: Periodically check that the lighting board is held in place by the turn screws. They can vibrate loose. Taping them might not be a bad idea. Make sure the boat is bow heavy before taking to the road. Don’t forget the bow lashing and the aft strop. Rigging: Do not unhook the trailer when setting up the rig. 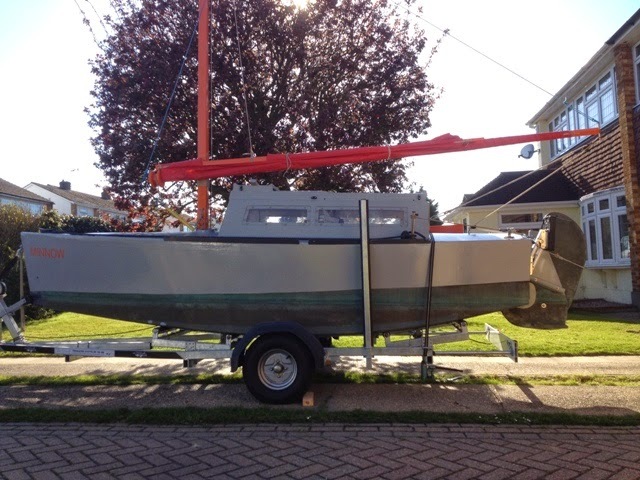 Alternatively jack up the aft end of the trailer before rigging. This will stabilize the trailer. 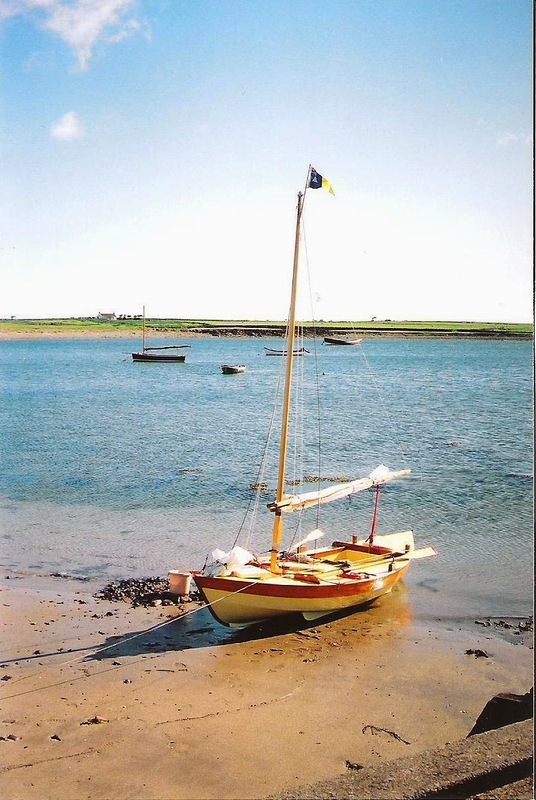 Attach the pennant to the top of the mast, unless you want a quiet night, because, if there is any wind, it rattles. Launching and Retrieving: Make sure the lighting board is removed before launching. Use the thick warp tied to the ball hitch and the trailer to obtain sufficient depth for ‘Minnow’ to float off. 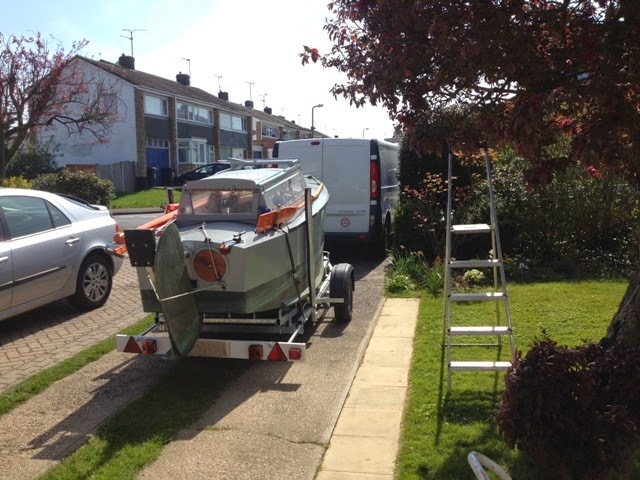 You can chock her on the slipway so that the trailer can be separated from the car. 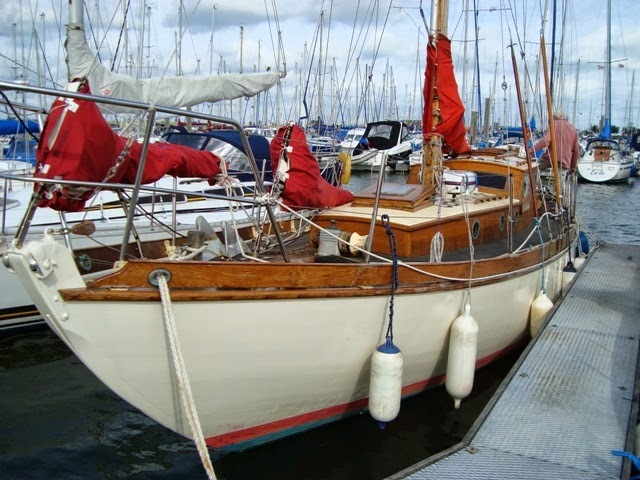 (Make sure there is plenty of weight in the bow before unhooking, otherwise the boat may fall back on her rudder.) Move the car up the slipway. Tie the rope to the trailer and the other end to the ball hitch. 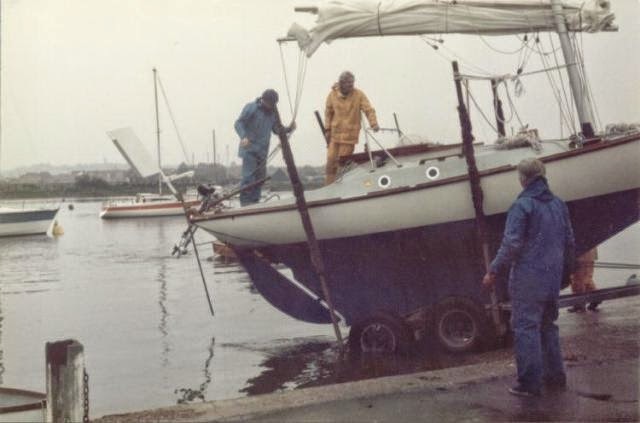 Drive a short way up the slipway; move the chocks, and slowly reverse until there is enough water under the boat to float her off. 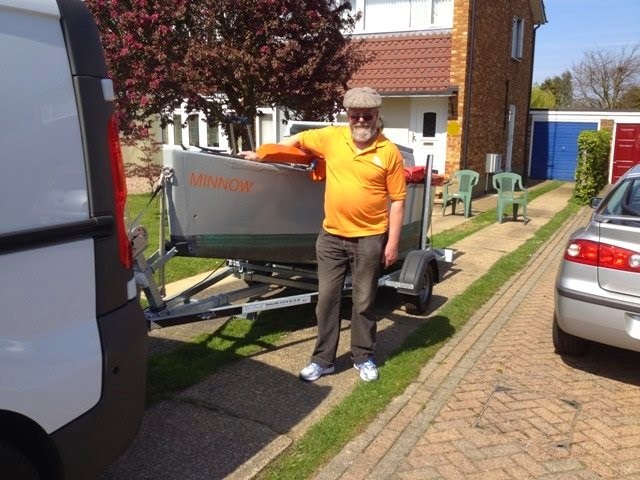 Don’t forget to have the anchor line ready for securing the boat before the trailer is withdrawn from the water. 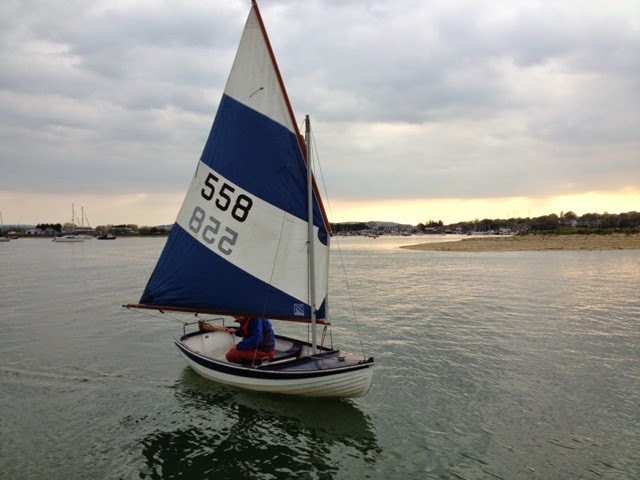 Making Sail: Get the furled sail topped up before hoisting it. 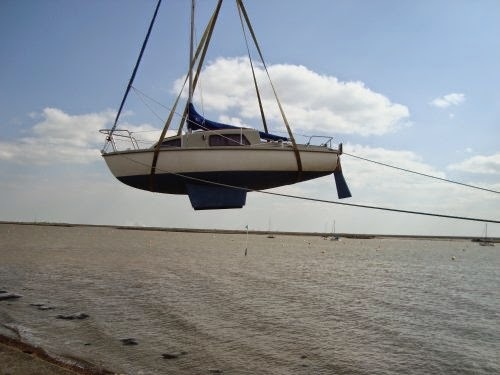 When hoisting the sail, make sure the yard does not get caught under the topping lift. Use gloves when handling the running rigging. Sailing: Try not to allow the sheet to become too slack, otherwise it may catch on the aft cleats or the engine. When tacking from starboard tack to port tack make sure the boat has plenty of momentum to take her round. If the water is choppy it may be better to wear ship. Therefore judge the situation in advance to make sure you have room for wearing ship. When on the wind do not pinch – sail a bit free. 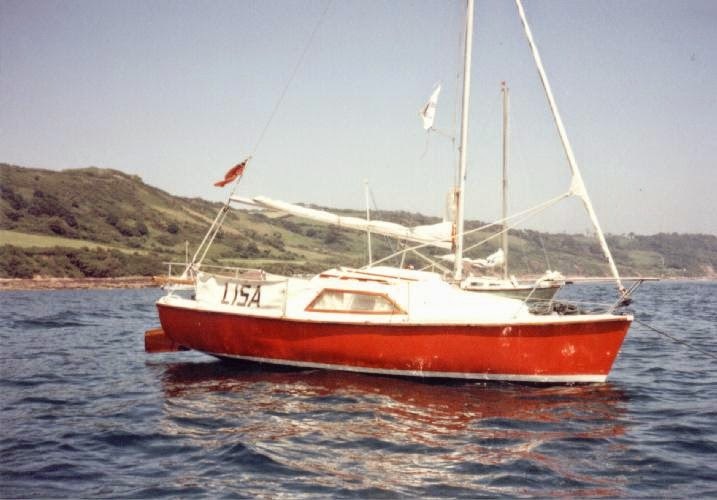 She sails best to windward when the windward chine runner is just clear of the water. You’ll need a Force 3 for this. Rudder: Unless sailing in shallow water, always keep the rudder fully down. You might need to push it fully down. 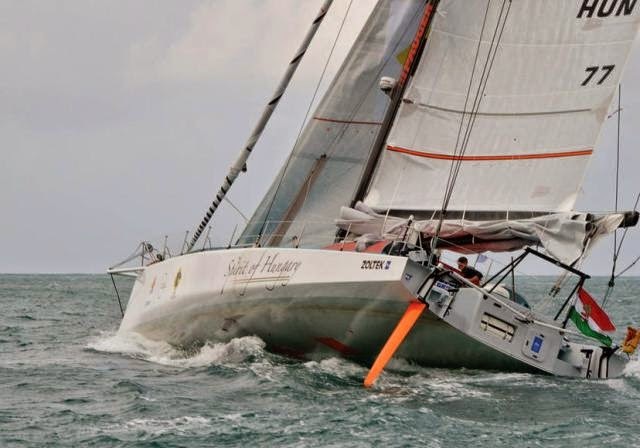 Never use more than about 15 degrees of helm – particularly when tacking, because she must be sailed around in an arc without losing too much way. Trim: Make sure there is enough ballast up forward to submerge the foot of the stem about 3 inches. When trimmed properly the bottom of the transom should be level with or just above the surface of the water. Engine: When starting cold, use about half choke. Start the engine in the raised position for getting a good pull with the cord. Then immerse the prop to allow cooling water to flow. Gradually reduce choke until the engine is running smoothly. It may be possible to idle the engine so that the prop stops rotating. (I have had difficulty doing this. Perhaps the carburettor needs cleaning.) Use unleaded petrol with no oil. The engine can always be kept in the upright position – either up or down. This way the sheet can be kept clear. Bungees can also help prevent the sheet from snagging the engine. There is a plug spanner and a spare plug in a tray in the lazarette. Petrol: Take the greatest care. Make sure the lids of the cans are secure. Use the funnel and its bungee when filling the engine tank. Yuloh: You can use the little bungee to help keep the yuloh on the pin. Raise the rudder out of the water when yulohing. Aft Vent Hatch: With the present sheeting arrangement, the hatch must remain closed. Anchoring: It is best to keep the anchor in a large bucket or watertight plastic container, along with its chain and warp. Keep them out of the way in the cabin, forward on the starboard hand side, ready for deployment. When deploying or retrieving the anchor, lash the bucket or container to the aft deck by the yuloh blade. From there the anchor can be lowered or raised. When retrieving the anchor, flake the warp into the bucket, then the chain, and finally the anchor. Cleaning the warp and anchor is best done with a loo brush as they are being raised. This way, mud and weed are kept out of the boat. Battery: This is excellent. It should remain charged by being topped up by the solar panel. It is maintenance free. Tiller Extension: I sometimes prefer using it to the steering lines. Safety: A fire extinguisher would be good to have aboard. A loop of rope at the stern, long enough for a foothold would be useful for getting aboard if one were to fall off the boat. The rudder step is too high for getting a foothold. Note: I’m looking forward to transferring custodianship to the new owner -More about that tomorrow. I enjoy sitting in the garden on a fine sunny day. The experience is always one of relaxation. My wife is the gardener and I am her ‘rotavator’. She knows about plants and the likes of ericaceous soil. I just like watching the birds and the bees. There’s a blackbirds’ nest full of chicks in the bay tree. Their mum and dad spend all day feeding ever-open beaks. Two lovey-dovey collar doves have their residence in the weeping willow. They preen one another, coo and whatnot. The garden fence is the runway for a pair of squirrels. Hoverflies perform miraculous antics; after hovering for a few moments, they zoom off at the speed of light, then they resume hover mode, before repeating the performance over and over again. 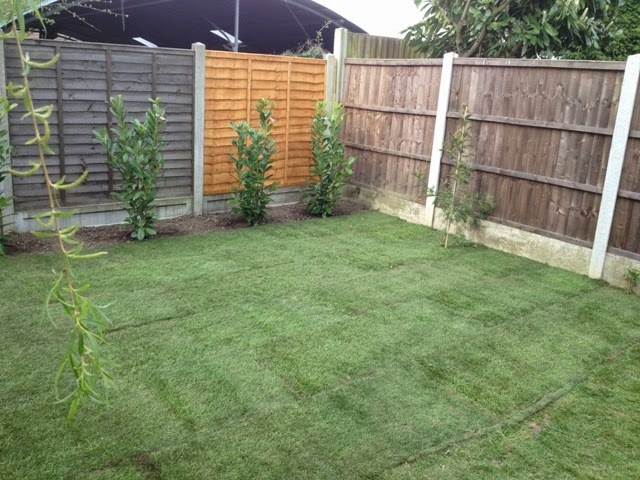 Well, after spending six days rotavating and destroying weeds at the bottom of the garden, today I spent most hours of daylight laying turf. 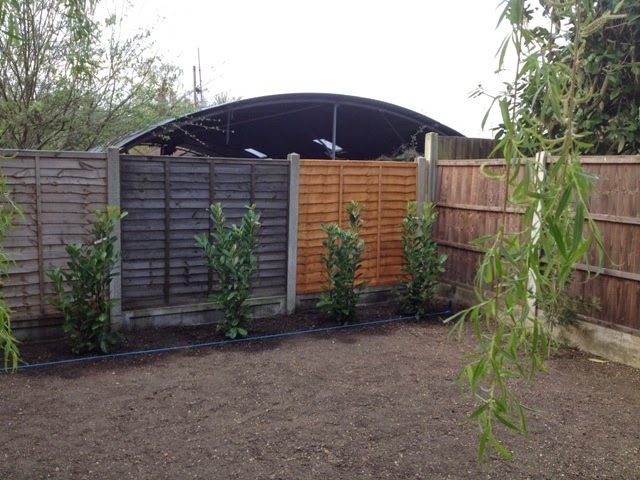 Yesterday I set four laurel bushes in place, exactly where the chief gardener wanted them; they stand erect like guards guarding the lawns of Buckingham Palace. In time they will grow taller and taller to hide the ugly Nissan shed that overlooks the fence separating our garden from the adjacent flower nursery. Gardens require care and labour if they are to be developed and transformed into personal paradises. I shall become a ‘watering can’ for the next few weeks for providing liquid refreshment to the thirsty turf and laurel plants. 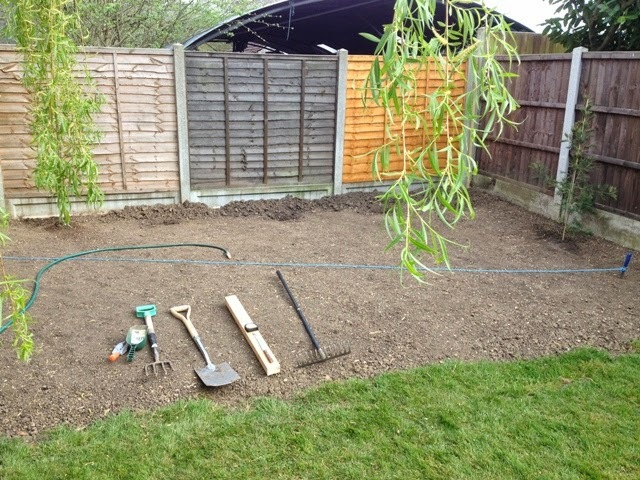 Of late I’ve been occupied with a special project in the back garden, and other enforced activities have prevented me from writing articles for the blog because of lack of time. This evening I have a few minutes to upload a couple of photos. They are of places that have significance for me because of their many associations over the past forty-three years since moving to Essex from the West Country in 1972. 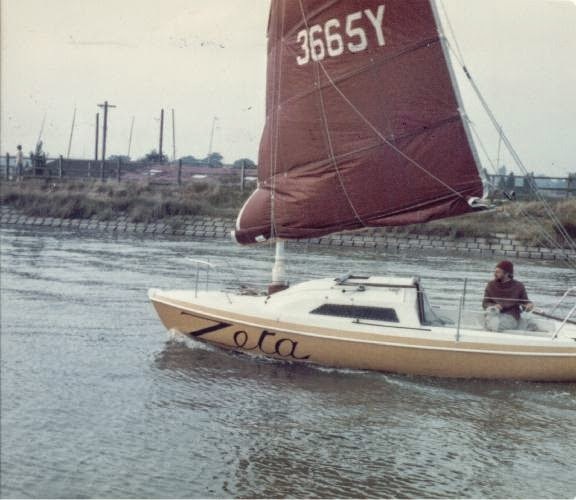 The first photo was taken at the Ferry Road slipway, Hullbridge, overlooking the River Crouch, a place that has become very dear to me. I’ve lost count of the number of boats I have sailed past that very spot. It is a photograph full of action. 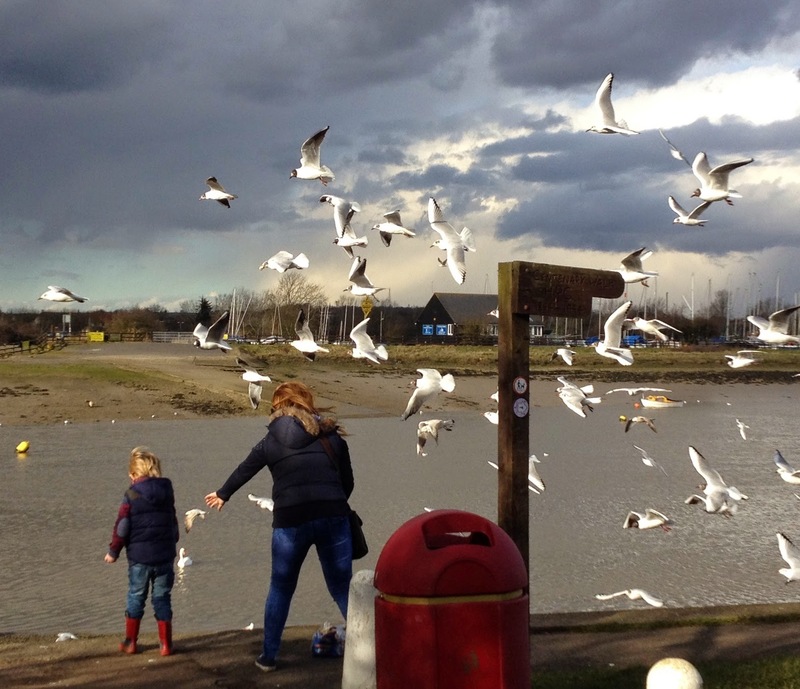 A mother and her child are feeding swans while opportunist Black-headed Gulls look for morsels too. Contrasting tones and sharp shadows add to the drama. 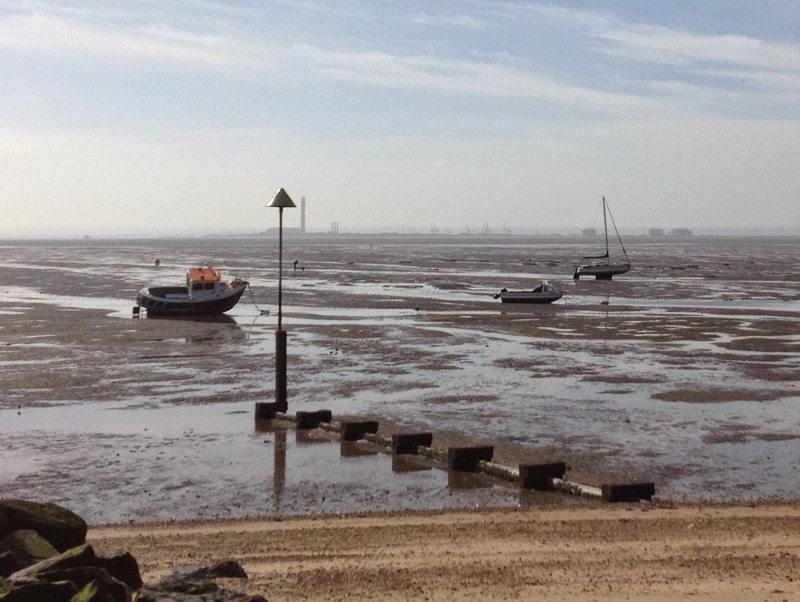 The second photo was taken at Thorpe Bay. A long way away on the Kent side of the River Thames, there are faint images of industrial structures at the Isle of Grain, the most distinctive being the tall chimney of the old power station. It can be seen just to the right of the starboard hand beacon at the end of the nearby drain groyne. The detail photo shows the chimney more clearly. 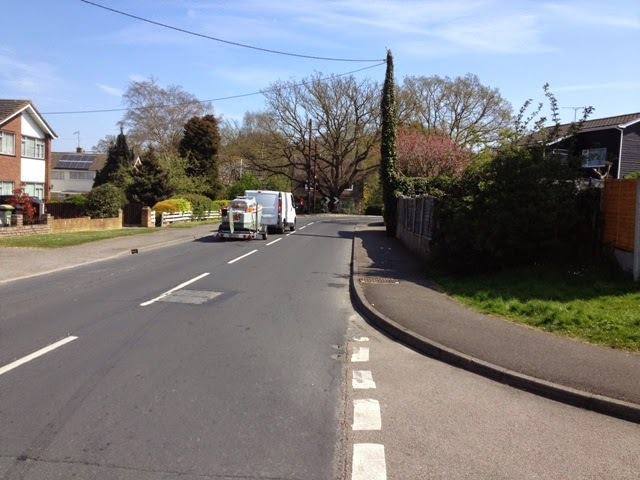 By contrast with the Hullbridge scene, this is one of calm and peace. The main photos are both over 2 MB. They are considerably larger than is normal for these pages. I did this so that they could be copied and used as wallpaper. 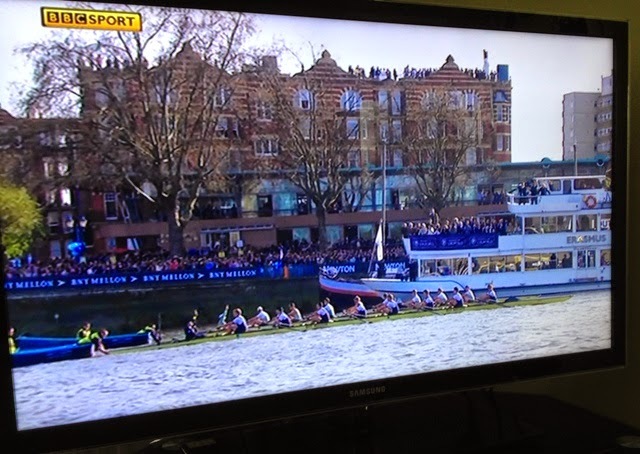 Following on from the previous post, and continuing with the theme of rowing, the annual boat race between Oxford and Cambridge University Boat Clubs took place last Saturday, 11th April. It was a double whammy for Oxford, for both the women’s and men’s teams won against their rivals. 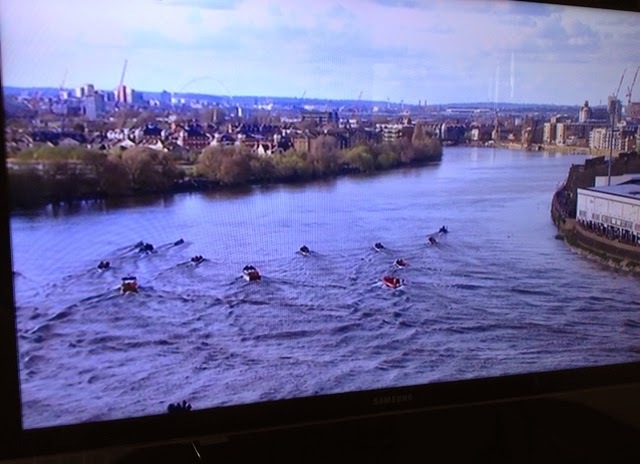 History was made, because for the first time since the inauguration of the women’s races, both the men’s and women’s teams raced on the Thames on the same day. What interested me was the distinct contrast between the efficiency of the boats being rowed and the motorised vessels following in their wakes. The lean, low and long* rowing eights left very little wake; any turbulence came from their asymmetrical sweep oars. Being rowed at an average speed of about 15 mph they clove through the water, whereas the motorized vessels in pursuit threw up enormous washes causing havoc to moored boats either side of the river. 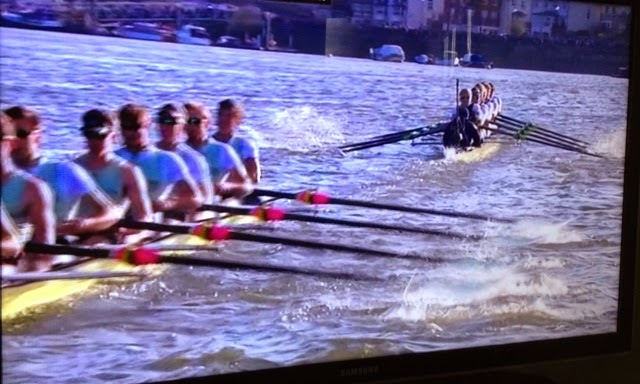 I felt for the men’s Cambridge team, because the Oxford crew were the more powerful. As the distance lengthened between the boats I became concerned as the pursuing flotilla appeared to get closer and closer to the straggler. I did not understand the water flow dynamics, and I couldn’t work out if the Cambridge boat was having a helping hand by being pushed forwards by the combined thrust of the bow waves of the following boats, or if she was being drawn back by the combined flow of water from the propellers. Curious as to how Charlie Pitcher is doing, I did a bit of Googling to come up with the latest news. 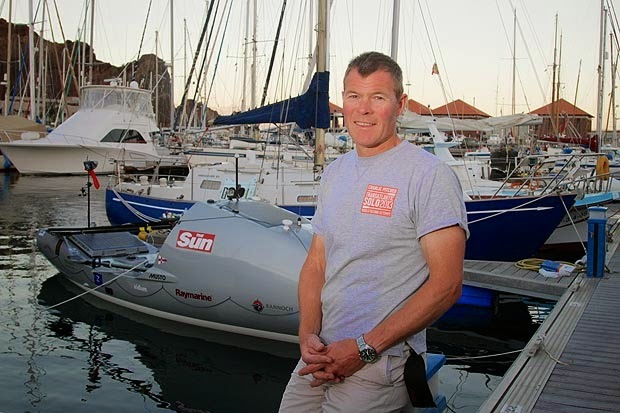 He now has a new website* devoted to his planned solo row around Great Britain. So far I have not seen a definitive map showing the proposed route. 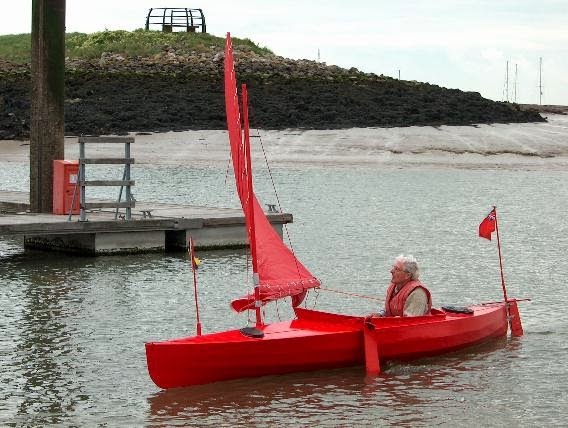 All I know is that he plans to make a last-minute choice whether to row north or south after exiting the Thames estuary. Apparently this will be decided after studying the weather forecasts at the time to gain maximum advantage of likely wind systems. Tides he can do nothing about. 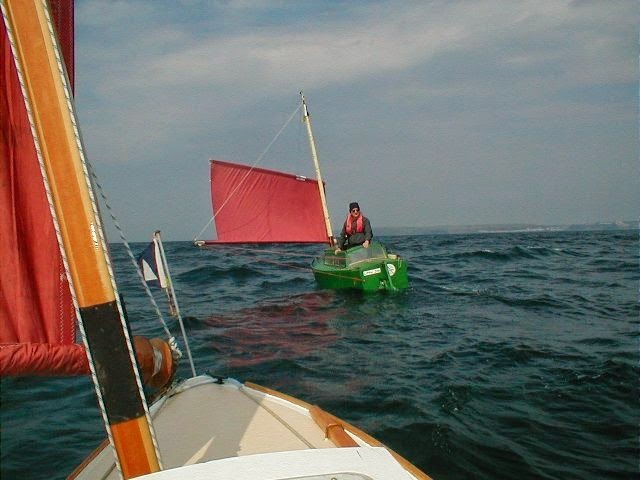 If he chooses to row around Kent and down the English Channel he will most likely find himself rowing against the prevailing SW wind, and he will also have to row against twenty minutes or so of adverse tide twice in every twenty-four hours. 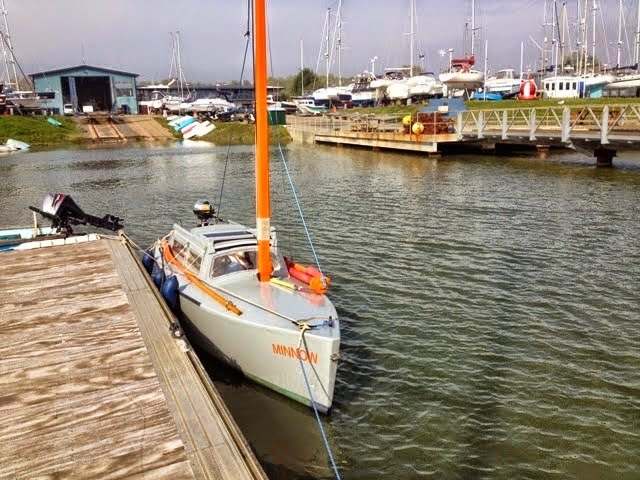 If he chooses to row north up the east coasts of England and Scotland and the wind is offshore, he could keep closer inshore than normal to take advantage of smoother water. The problem is finding time to sleep, and of course there are many obstructions such as wind farms, gas and oil platforms, fishing boats, coastal traffic and headlands. I do not know if he plans to row north of the Shetlands, which technically he should if he wants to actually row around Great Britain, but if he does, he’ll most likely have to make a very good offing to the west after leaving the Islands before heading southwest and south to be well offshore to safely keep clear of the Outer Hebrides and the western coast of Ireland. 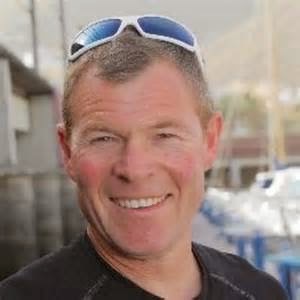 The Round Britain Race starts at Plymouth and the course is clockwise, which makes a lot of sense, because the prevailing wind is from the SW, so that when the yachts are sailing west of Ireland and the Outer Hebrides the wind is from behind or on the quarter. If Charlie were to take a similar route he would also have this advantage. This would also be better for rounding the Shetland Islands. Later, he could take advantage of being in the lee of Scotland and England. Charlie will have no doubt whatsoever that his planned adventure will be the most challenging to date. I still rate his chances of doing it non-stop at 50/50, but I wish him success. If anyone will do it, Charlie is that man. 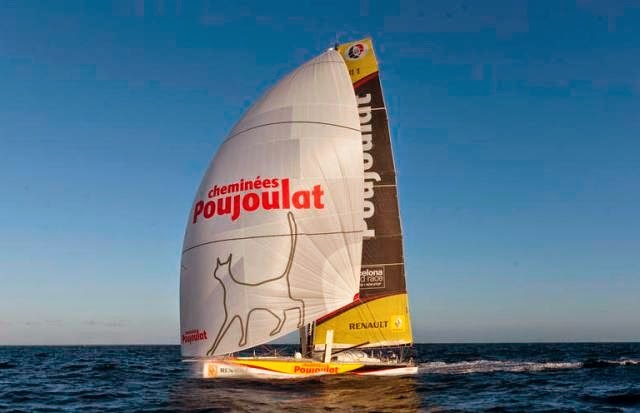 Bernard Stamm and Jean Le Cam, aboard Cheminees Poujoulat, were the first to cross the finish line on 25th March with a time of 84 days, 5 hours and 25 seconds. 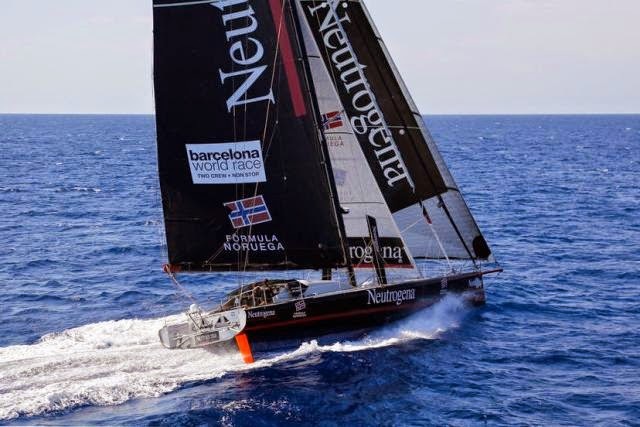 Neutrogena followed five days later, and third place was taken by Gaes Centros Auditivos. 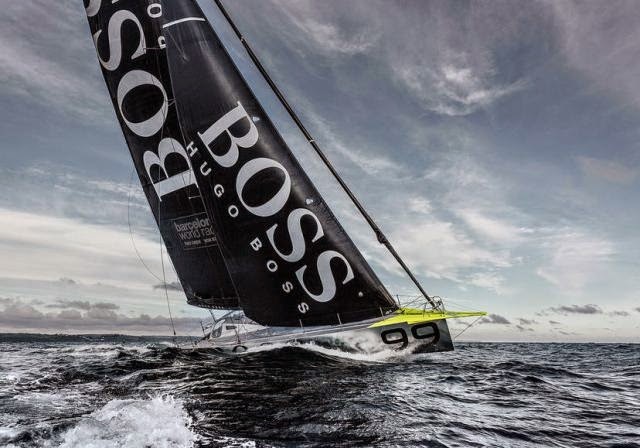 I lost interest early in the race when Alex Thomson and Pepe Ribes retired after their yacht Hugo Boss lost her mast. I had high hopes that they would do well - even to win. Both boat and crew were well tested, and they consistently showed they had what it takes to win. Therefore, it was a big disappointment when tragedy struck, for they were out in front by a good margin. They were my favourites to win, and my second favourites were Nandor Fa and Conrad Colman, racing Spirit of Hungary - not that I thought they would win, but I admired them for their enthusiasm and determination, despite the odds. Unlike the other competitors, they had no major sponsors. 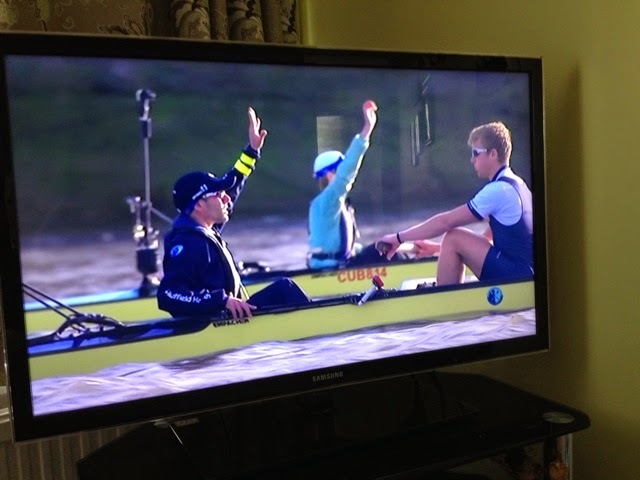 They knew they were the underdogs, but for them taking part and finishing the race was what it was all about. 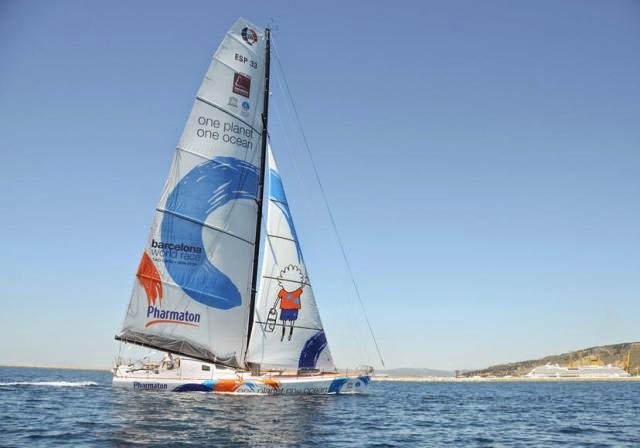 I’m not surprised they are trailing behind the current leader, One Planet, One Ocean / Pharmaton, by 2,240 miles, but you can be sure that if they succeed in finishing, they will be elated by their achievement.